Rojak is typically a tossed salad of various ingredients. Different ethnic groups have different versions of the dish. The Chinese cut up pineapple, cucumbers, turnips, bean sprouts and youtiao (dough fritters), and toss them with a sauce made of chilli, tamarind, lime and lime peel, and a prawn paste. The mixture is then topped with crushed roasted peanuts. 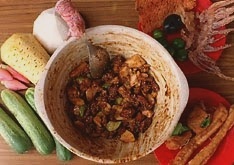 The Malay version is similar except that it contains tempeh (a patty made from cooked, fermented soya beans) and tahu goreng (fried bean curd). With Indian rojak, customers choose which specific ingredients they would like in their dish; these might include boiled diced potatoes, hard- boiled eggs, fried bean curd, vadai (fried dough with a chilli or prawn embedded in it) and fried squid, all served with a sweet chilli sauce. Rojak has its origins in Indonesia where it is called ‘rujak’. A popular dish in east Java is rujak cingur which is similar to the Malay version of Singapore rojak except that it has a distinctive ingredient, cartilage from the nose of an ox (cingur). The word ‘rojak’ has entered Singapore English to mean ‘mix’. Cut pineapple, yam bean, cucumber, bean curd puffs and dough fritters into pieces. Mix red ginger plant bud, 3/4 of the ground peanuts and all Sauce ingredients in large bowl. Add pineapple, yam bean, cucumber, bean curd puffs and bean sprouts. Toss and mix well till ingredients are well-coated with sauce. Transfer to serving dish. Top with dough fritters and remaining ground peanuts. Serve. * Red ginger plant bud is a must in this Chinese-style rojak that is available at most hawker centers. It gives the dish a special fragrance that has no substitute. Some hawkers, however, have stopped using it as it has become quite rare and expensive. Omit it if it is unavailable. Also, do not save on peanuts as they give the rojak its unique bite and fragrance. * Rojak is a Malay word and widely used to describe "a mixture" or "a melting pot". It is also a popular fruit and vegetable salad unique to Malaysia and Singapore.